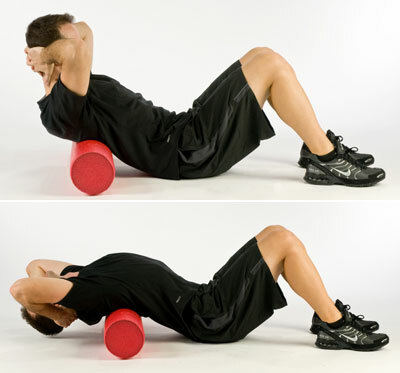 Military Press Hurts My Back, What Should I Do? Your low back most likely hurts when you perform military presses because you are hyperextending your lumbar spine during the movement. Most trainers would tell you that you need to work on your core stability and would prescribe a bunch of planks and the like. This usually does absolutely nothing to solve the problem. Tight core and legs (abs and glutes are tensed) * this is important! If this works for you, congratulations!!! If one of these are the case, then you need to work on bringing up your shoulder flexion or thoracic extension mobility, and then you need to blend the newfound gains in mobility into your motor programs. Your body will still want to use the same form it’s always used even though you’ve gained mobility, so you have to rewrite your movement patterns. A 2-4 month flexibility program may therefore be in order along with a gradual reintroduction to the movement. You may also have poor stability, but it’s usually not a lack of core (ab/oblique/erector) strength, it’s just poor patterning. It’s worth mentioning that many folks are very resilient to hyperextension and experience no pain with the military press even if they lean excessively (I’ve notice the same thing with hip thrusts and back extensions). Other folks are able to master military press form relatively quickly from simply practicing the form with lighter weight while squeezing the abs/glutes and focusing on remaining relatively upright to prevent lumbar hyperextension. Some folks start overarching the back only when the loads get heavier. If you fall into this category, you might be able to get away with military pressing with solely lighter loads (for example, sets of 10 reps or higher). Refrain from going heavier, refrain from going near failure (keep a couple of reps in the tank to avoid encouraging excessive lean), and always try to remain as upright as possible. Let’s say that you’ve tried all of these things and you still experience back pain while military pressing. Don’t be depressed. Some folks simply don’t have the body structures to safely perform the military press. The slightest deviation from neutral spine irritates their lumbosacral regions, and some have tremendous trouble avoiding lumbar hyperextension with the military press. This could be due to their strength curves – perhaps they’re just so dramatically stronger in the incline press ROM and therefore they always inherently resort to leaning back to mimic the incline pressing motion when the loads get heavy. 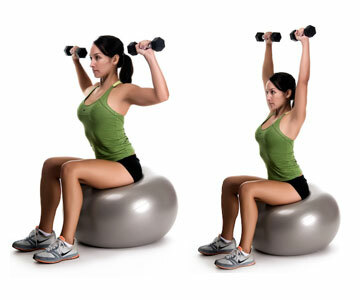 If you go with the seated variations, please make sure that you choose a bench that doesn’t pin your scapulae together. You’ll need a lower-height military bench for this as the taller are usually problematic in this regard. 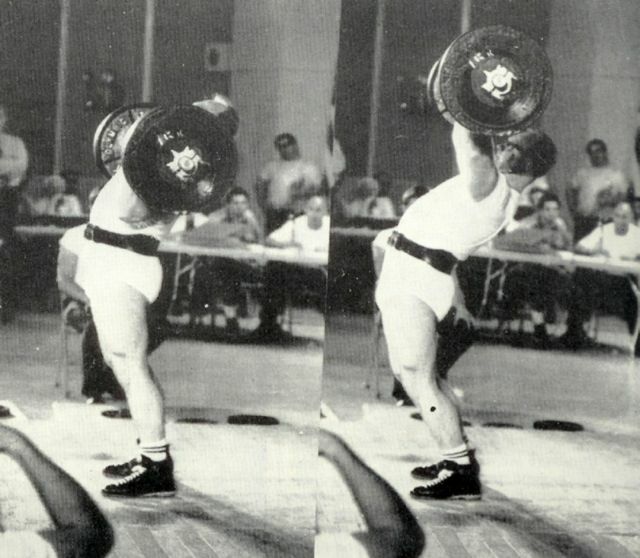 Don’t underestimate the seated barbell overhead press – many bodybuilders prefer this variation. I’ve found this to be a pretty good alternative for folks who always experience low back pain from performing military press yet still want to perform a movement that they feel gives more “bang for their buck” and enhances functional stability. It’s done out of the rack in the half-kneeling position, which requires sound levels of hip stability (the adductors and abductors on the front leg are getting stimulated in hip flexion, while the adductors and abductors on the rear leg are getting stimulated from a neutral hip position). Make sure to squeeze the glute on the rear leg. Some folks (like me) don’t see much of a drop-off in strength when moving to this variation, however others have to move down in weight drastically until they gain coordination. I hope that answers your question, and best of luck! The post Military Press Hurts My Back, What Should I Do? appeared first on Bret Contreras. The post You Got Guru’d: Max Relative Trap Bar Deadlift Strength Perfectly Predicts Speed, Power, and Endurance Performance appeared first on Bret Contreras. The post Squats and Deadlifts Aren’t Panning Out the Way I Hoped appeared first on Bret Contreras.